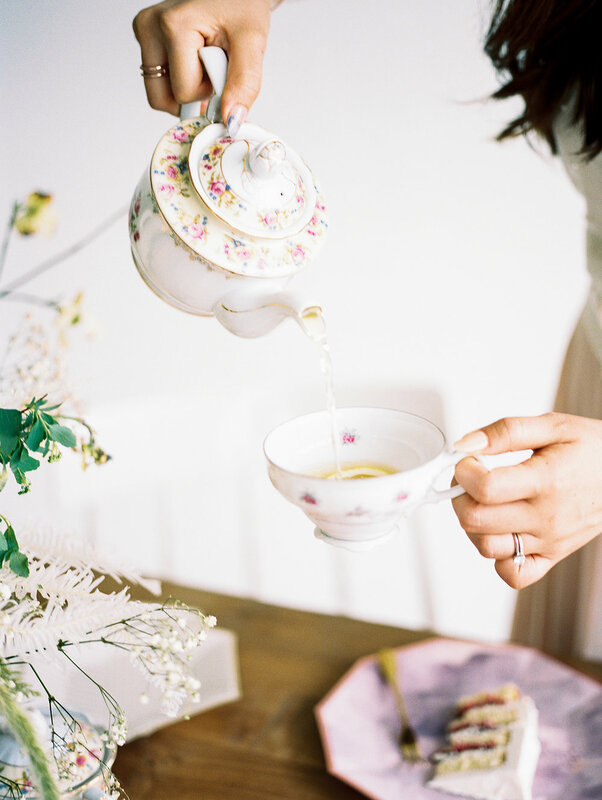 Last month, I partnered with Olea & Fig Studio to together present a chic afternoon tea party shoot in Brooklyn, NY. 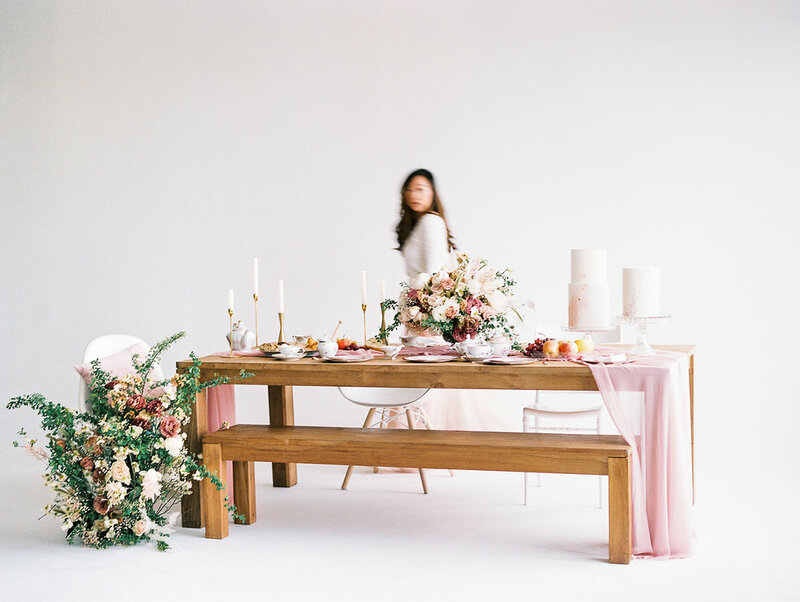 The San Francisco-based Olea & Fig Studio is founded by two sisters specializing in designing events and styling editorial shoots for their clients around the world. I love hosting dinners at home and inviting friends over for gatherings, but I really wanted to upgrade my hosting skills! 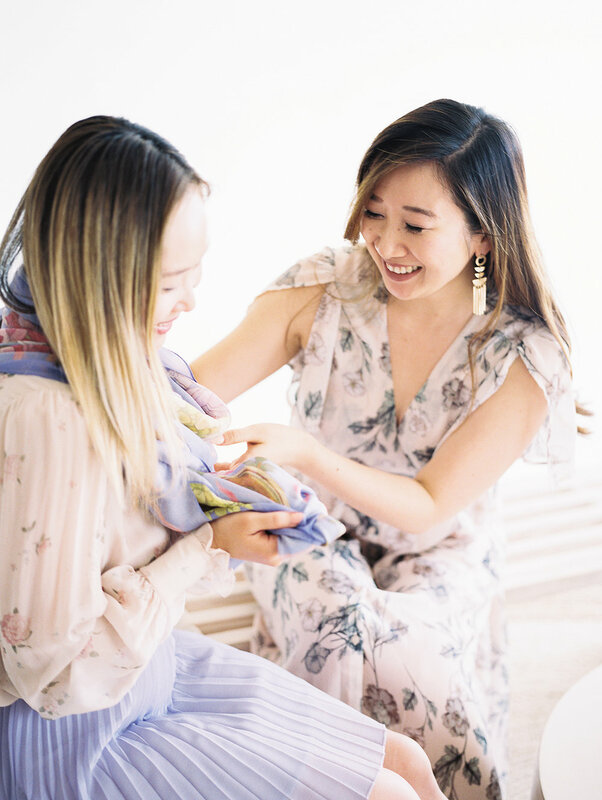 In case you want to learn some tricks as well, read on to see the questions I asked Annie Chang, co-founder of Olea & Fig Studio, and what her answers are! Cakes by Sugar Lane. 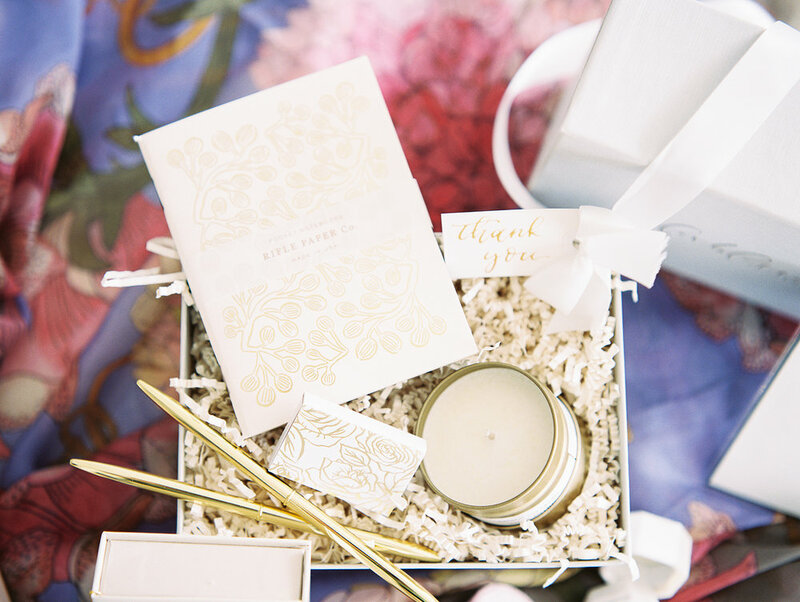 Styled by Olea & Fig Studio; Photo by Kylee Yee Photography. Annie, co-founder of Olea & Fig Studio, setting up the afternoon tea party shoot. Flowers by BloomBar; Furniture and china: Little Vintage Rentals and Your Green Room. Q: What are some key pointers to setting up a tea party? A: The atmosphere is very important, especially when it comes to hosting a personal celebration! Besides delicious food and fantastic company, most importantly, we want our guests to have a wonderful time! Therefore, a thoughtfully-designed atmosphere where the guest can feel very comfortable and welcomed is the key to creating great memories and experience! Specifically for a tea party, one important thing to remember is that you would need a larger kettle to keep the freshly-brewed hot tea coming! As for food, because it is in the afternoon, and they're most likely all prepared to serve guests before their arrival, you may want to consider choices that won't necessarily need to be served warm, like open sandwiches, pastries or other desserts. 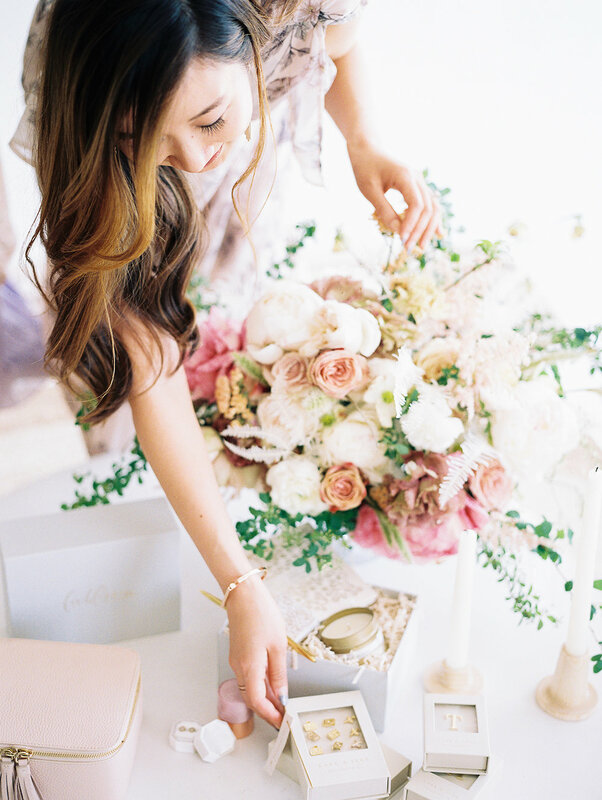 Styled by Olea & Fig Studio; Photo by Kylee Yee Photography. Q: What if there is a tight budget, but you still want to put together something really nice? A: Beautifully-designed, sustainable paper plates would be a great option here! Since we are not planning a wedding or an extravagant party, disposable plates work perfectly. And not just budget-wise, but also when you are cleaning up! Harlow & Grey, for example, offers a selection of beautifully-designed, modern paper plates and cups, as well as other party supplies. Table runners are generally really good for adding that oomph to a tablescape design, too. To create that warm, romantic feeling, silk runners are a lot of event designers’ and photo stylists’ go-to linen these days. However, they are definitely on the pricier side. Alternatively, you can go for cheesecloth runners if you are on a budget! There are a lot of hand-dyed cheesecloth runners you can choose from on Etsy. And for personal gatherings, these may even be better for building that intimate atmosphere since they carry more of a casual setting. 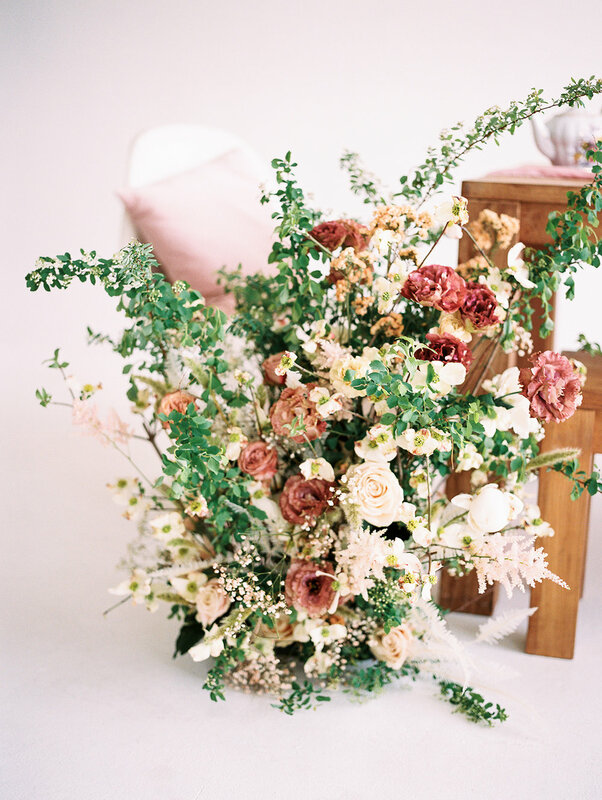 If you don’t have the budget for flowers, try to opt for greenery! Eucalyptus is an all-time favorite! All you need is a few bottles or glasses and simply throw in a few stems in each one. As for adding a pop of color, give fresh fruit a try! You would be pleasantly surprised by the beautiful color palettes you could create with these options! Paper plates by Harlow & Grey; Styled by Olea & Fig Studio; Photo by Kylee Yee Photography. Adding a table runner makes all the difference. 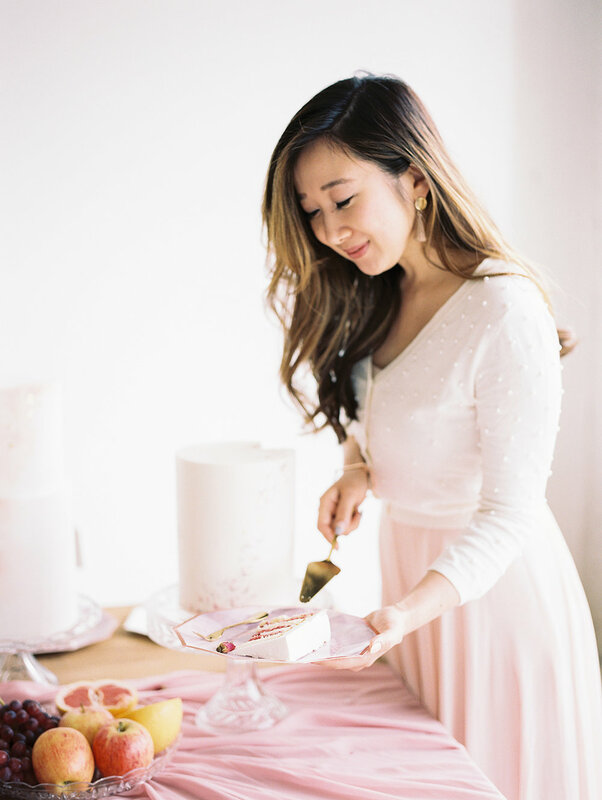 Flowers by BloomBar; Cakes by Sugar Lane; Furniture and china: Little Vintage Rentals and Your Green Room; Styled by Olea & Fig Studio; Photo by Kylee Yee Photography. 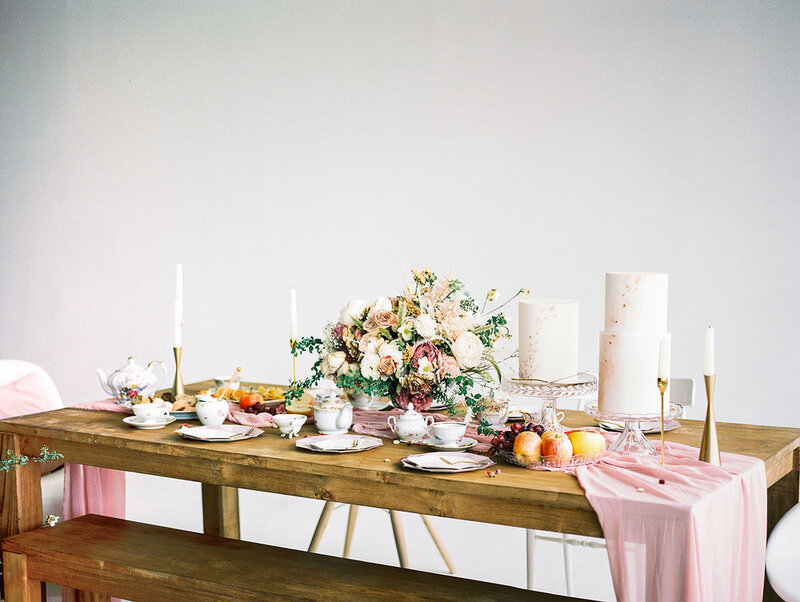 Q: What are some personal event-styling tips you’d like to share? A: This is one thing that seems intuitive but is often missed: the room temperature of the venue! When hosting any party, remember to check the weather ahead of time and get a rough head count to help you prepare accordingly. Whether it is to add a fan, turn on your air-conditioning or heater beforehand! A: Preparing guest favors would be a nice touch to end the tea party! 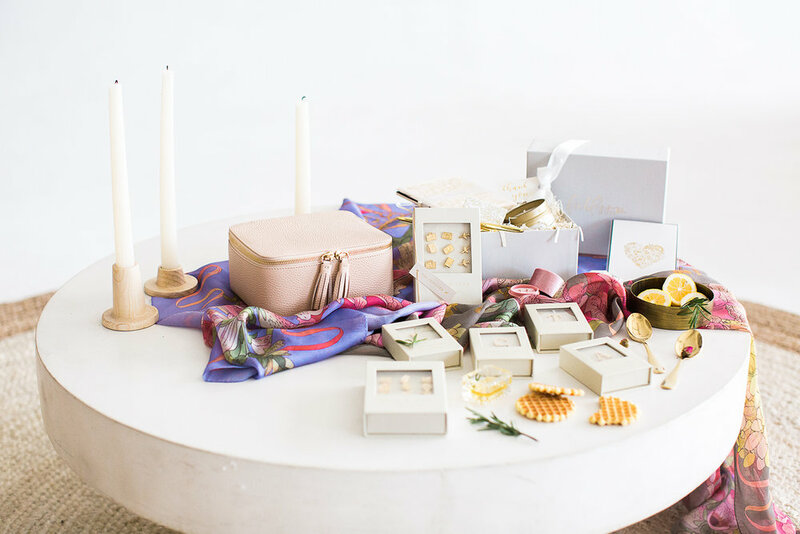 Whether it is an elegant scarf by CHRISU, cute ring boxes from eselleSF or Lace Byrd, a travel jewelry case from Cuyana, or unique and memorable pins by Lark&Ives, pick out something that you sincerely love and that you want your guest to have. You can also consider a gift box from Foxblossom if you need some inspiration! Boxes of unique and memorable pins by Lark&Ives. Surprise your guests with a nice gift! Olea & Fig Studio; Photo by Kylee Yee Photography. Mary Gui from @layerofchic_ tries on the scarf from CHRISU. Q: Let's talk about the shoot! What are the design concept and some key features you'd like to highlight? A: We’ve always been a fan of your romantic and timeless style that comes with a modern twist, and when we spotted the runway set up of Tory Burch FW ‘18, we decided to channel this inviting garden feel to the afternoon tea party we are creating with you! 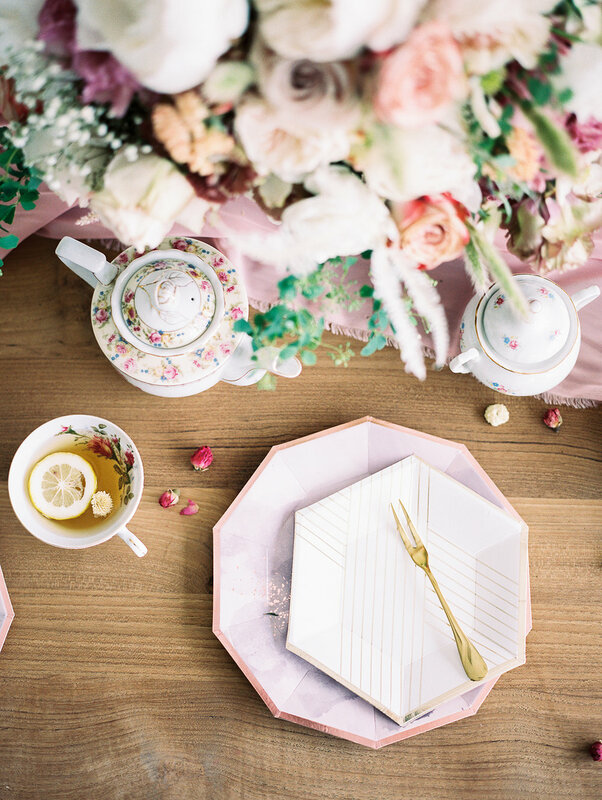 Since this lovely afternoon tea took place in spring, we wanted to also incorporate a few popular SS ‘18 trends, such as transparency, sheerness, millennial pink, pastels and fringe-like textures. Furniture and china: Little Vintage Rentals and Your Green Room; Styled by Olea & Fig Studio; Photo by Kylee Yee Photography. 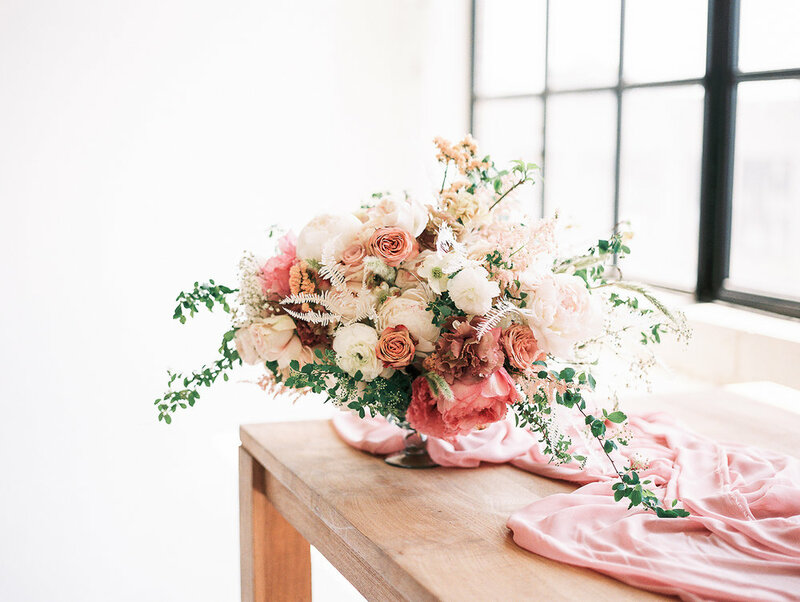 Flowers by BloomBar; Photo by Kylee Yee Photography. Having fun with my guest Mary Gui from @layersofchic_. We wanted to direct your style into our design, too — classic with a twist. The darling vintage tea set was paired with modern geometric paper plates, while the beautiful wooden benches and jute ottoman were styled with contemporary chairs. For the floral, paper and cake designs, we focused on showcasing the beauty of natural textures. From watercolor invitation design, hand-dyed ribbons, hand-painted cake design, to the garden-inspired floor arrangements and the organic lush centerpiece with pieces trailing down the table runner. We also added a few different fruits to our tablescape to create that inviting and intimate atmosphere. Invitations and paper designed by Kelly Design Co.
Let me know what you think of this tea party set up by leaving a comment below! Thank you for reading! Fall is coming. Grab your basket and girlfriends and go on a picnic date before summer ends!